Born shopaholic! 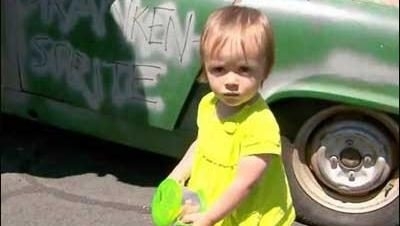 A one-year-old girl in the US has bought a car through online trading, while playing on the mobile phone of her dad, who has decided to keep the "purchase". Paul Stoute from Portland, Oregon, said he got a notice from eBay congratulating him on his purchase of USD 225. He was the proud owner of a 1962 Austin-Healey Sprite. To Stoute's astonishment, he had not made the purchase. After verifying the purchase, he realised that his young daughter, who really enjoys playing with his smartphone, had logged into the eBay app which can be used to instantly make a purchase. "Tap, tap, tap and now I own a car," Stoute was quoted by KPTV as saying. Stoute had been looking at cars on eBay with the idea of tackling a rebuilding project with a friend. "Fortunately, she didn't buy the USD 38,000 Porsche," he said. Also fortunate is that the Sprite was located in Tualatin. It's now being stored in Milwaukie and is very much a fixer-upper. The eBay ad listed it as a "Frankensprite." "It comes with two engines," said Christina Stoute, Sorella's mother. "They're both in the back seat." The couple now hopes to take the eBay mistake and turn it into a very memorable gift. high school graduation. In the meantime, they have added password protection tob their phones, and uninstalled any apps that can be used to make a purchase.